This volume offers a complete picture of Puebloan culture from its prehistoric beginnings through twenty-five hundred years of growth and change, ending with the modern-day Pueblo Indians of New Mexico and Arizona. Aerial and ground photographs, over 325 in colour, and sixty settlement plans provide an armchair trip to ruins that are open to the public and that may be visited or viewed from nearby. Included, too, are the living Pueblos from Taos in north central New Mexico along the Rio Grande Valley to Isleta, and westward through Acoma and Zuni to the Hopi Pueblos in Arizona. 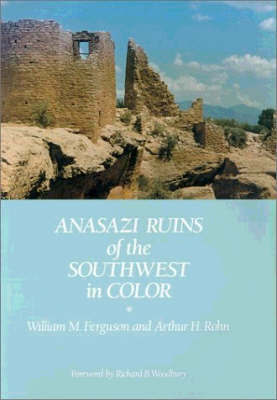 In addition to the architecture of the ruins, 'Puebloan Ruins of the Southwest' gives a detailed overview of the Pueblo Indians' lifestyles including their spiritual practices, food, clothing, shelter, physical appearance, tools, government, water management, trade, ceramics, and migrations. Buy Puebloan Ruins of the Southwest by Arthur H. Rohn from Australia's Online Independent Bookstore, Boomerang Books.